Apple's stock price on Wednesday afternoon broke $140 per share and is only a few dollars short of both a pre-split $1000 valuation and breaking the company's previous market capitalization record of $774.69 billion set in 2015. At $140, Apple's stock price is $7.82 away from breaking the old market capitalization record, briefly reached on Feb 23, 2015. At the same price, the oft-discussed $1000 per-share valuation corrected for the split is only a $2.86 rise away. On Wednesday, the stock sat at $137.95 at the start of business, after jumping up nearly $1 in after-hours trading from Tuesday's active session. 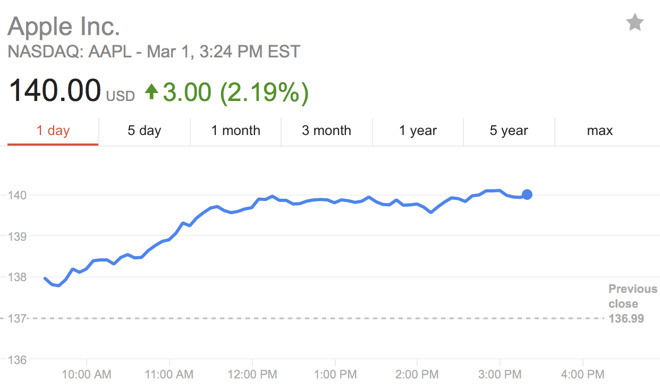 Apple's market capitalization broke $700 billion on Feb. 14. In the last 30 days, AAPL has jumped from $128.75. The week's AAPL gains seem to be related to remarks made by Warren Buffett to the press on Monday, with the financial head claiming that Berkshire Hathaway had purchased 133 million shares in the stock in 2016 and 2017. Apple wasn't the biggest point contributor to Wednesday's 1000-point DOW gains, with 35% of the total gain split between Apple, Goldman Sachs, and Boeing. It is likely investors will keep the rising price trend going, with analysts suggesting it can go far higher in fiscal year 2017. While some suggest Apple could climb to between $140 and $150 per share, with Goldman Sachs' confidence in the fall iPhone refresh prompting it to raise its target price to $150, some analysts believe the price could go as high as $156 per share. UBS analyst Steven Milunovich said in a research note that Apple's Services arm is undervalued by investors, compared to other parts of the company. After generating $7.17 billion in revenue in the last quarter and demonstrating steady revenue growth, Milunovich suggests "If Apple services were valued similarly to PayPal, the stock would be at least 10 percent higher."